Pope Emeritus Benedict XVI’s call for the New Evangelization continues to inspire Catholics across the globe, as they go forth and proclaim the Gospel through the new channels of communication available in the modern day. Christendom alumnus Dominic de Souza is answering this call through his new website, Saintnook — a dynamic social network that seeks to transform the way we learn and experience the lives of the saints. Developed by de Souza earlier this year, Saintnook is the first website to present the saints as people who are still alive and active in our lives today, rather than simply re-sharing their biographies. By offering the saints to students and children through beautiful imagery and modern social media techniques, de Souza sees Saintnook as a means of educating students in an attractive manner that they can relate to. “Developing Saintnook is an ongoing opportunity to bring together three separate themes about the saints in one place; their art, their stories, and their ‘alive-ness.’ By developing a social network, it is now possible for children and students to learn the basic information about the saints, and then come to understand them on their terms, through their friends, group interests and so on. It’s more hands-on than a book about their lives — it’s a little more like a movie, because our focus is on beautiful, inspiring visuals,” says de Souza. Blending together a social network presentation, in-depth Pinterest galleries, easy-to-read saint biographies, and beautiful graphics, de Souza’s creation is a unique website that offers a fresh angle to the New Evangelization. His ongoing desire to transform the way people encounter the saints is something de Souza attributes to his Christendom education. “My time at Christendom brought me a greater sense of confidence in my writing and style of prose, which has translated into a strong design aesthetic, looking to portray the good, the true, and the beautiful through a modern lens,” de Souza says. “I remember being struck in Christendom’s classes by the concept that in philosophy we are Greek, in law we are Roman, and in religion we are Judeo-Christian. This fascinating patchwork of cultural influences is the groundswell for Western Civilization as we have come to know it, and we are all called to be contributing members to this civilization. This means we have to know what it is that we have been singularly blessed with, which involves study and discussion,” he says. Christendom’s tight-knit community helped de Souza develop numerous connections with people who would aid his pursuit of a visual design career later as well, resulting not only in Saintnook, but also in CatholicViral.com, a website for family-friendly secular and Catholic viral content. Saintnook is already enjoying success and acclaim across social media, being lauded as a new resource for students and parents to expand their knowledge of the Catholic faith in a fun, informative way. De Souza hopes to expand the concept of Saintnook into further ventures in the future, such as a downloadable app for smart phones, a monthly magazine, and a trading card game for use in the classroom. 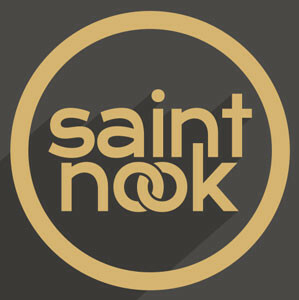 To find out more about Saintnook, please visit saintnook.com.